I came up with this recipe when I didn’t have time to grocery shop and basically emptied out my fridge, shaved some raw veggies, sauteed some green ones including peas and edamame from the freezer and made a quick dressing with noodles! It came out delish and is the perfect antidote for a lazy dinner when you don’t feel like making a separate salad and main dish. I’ve added some fresh herbs and chili to the recipe, which I think would take it to the next level. In a large pan heat up 2 tablespoons of avocado oil. Add green vegetables except kale, saute on medium low until browned and tender, you can add water to help cook the veggies down. Season with a little tamari sauce. In the last minute or so, add kale and toss until wilted but still bright green. Remove from heat and set aside. In a small bowl, whisk together dressing ingredients. Set aside. 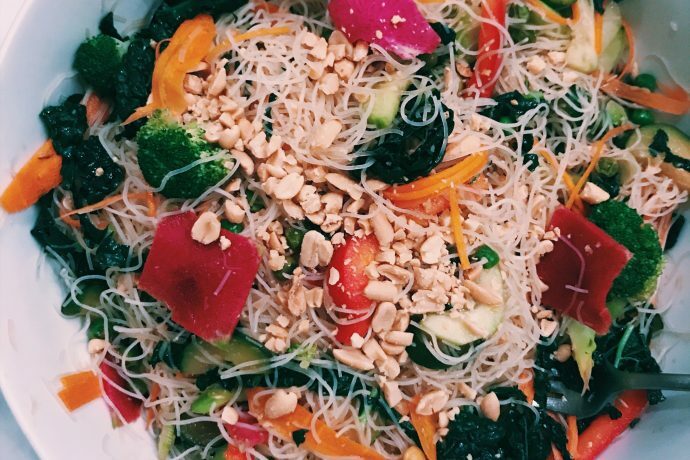 In a large bowl combine vermicelli noodles, raw shaved vegetables and toss. Pour dressing on top and toss. Then transfer warm cooked vegetables on top of the noodle mixture. Garnish with fresh herbs and peanuts. Serve with lime wedges.